Bills rookie QB Nathan Peterman played well for Buffalo, while their ground game impressed even without RB LeSean McCoy. Two late scoring passes from Lions rookie QB Brad Kaaya pushed the score to a respectable 27-17, however three turnovers proved too much to overcome for Detroit as they fell to Buffalo. 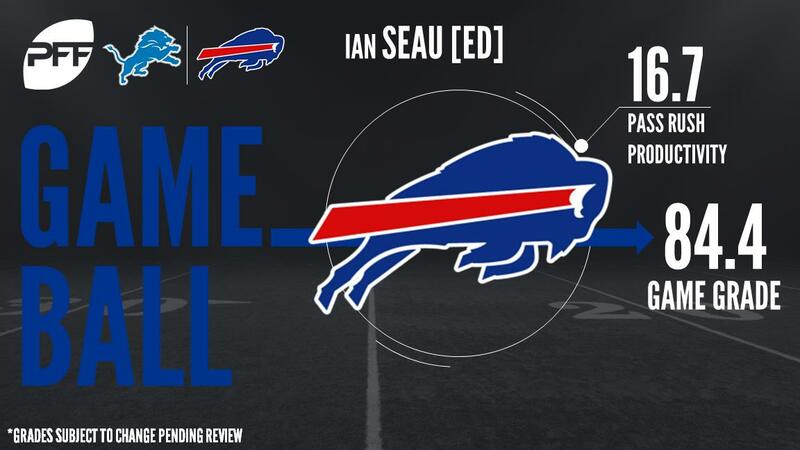 The final preseason game came, and went for the Lions and Bills, and with that, we give you our PFF exclusive takeaways from the contest for each team. Williams had limited opportunities to showcase his abilities but he made believers out of everyone with his amazing 172.0 elusive rating. Miller was the anchor of a solid offensive line performance. He posted the highest blocking grades of the starting unit and recorded a perfect pass-blocking efficiency (100.0). Seau dominated the edge against the Lions. His 4 total pressures (including a strip sack to end the game) led him to having the top-rated pass-rush productivity among his position group at 16.7. Yarbrough was the one who controlled the edge during the early part of the game, except his skill set shined against the run. He lead the team with a run-defense grade of 82.9 and posted the fourth-highest run-stop percentage among edge defenders, 18.2 percent. Green single-handedly made the game more exciting for Lions fans, particularly on his stellar 74-yard screen pass, outrunning multiple defenders and forcing 3 missed tackles out of the rest. His 66.7 elusive rating ranks top 10 among all HBs. Kaaya showed he has the skill set to make it as a NFL quarterback. His 77.8 percent accuracy and 104.8 PFF passer rating both ranked among the top 10 of quarterbacks this week. Lott was a force to reckon with in the middle of the Lions defense. Not only was he the top-graded player for his team, but he also lead all interior defenders in stop percentage for the night, 22.7 percent. Reeves-Maybin proved his worth out in coverage. Not only did he grade highest on the team (80.6 coverage grade), but his 19.0 coverage snaps per reception was second-highest among OLBs.